Since 2000, the Patch Sprint has served as a fund raiser for the Adirondack Scholarship Foundation, with over $100,000 being raised by event participants.. The Adirondack Scholarship Foundation, founded in 1981, is responsible for providing funds to families of children hoping to enjoy a summer camping experience. 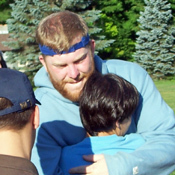 Pok-O-MacCready Camps annually offers this special opportunity to several individuals. On top of your mandatory race fee (which covers complimentary lodging, meals, a T-shirt, awards and race supplies), each racer, trekker and party attendee is asked to make a donation to our beneficiary. Many thanks: Your support is greatly appreciated! The Adirondack Scholarship Foundation is a 501(c)3 not-for-profit charitable organization. Your generous donation is entirely tax deductible.